Step aboard a vintage Maine Lobster Boat for a private, 2-hour lighthouse viewing & sightseeing charter. Leave the crowds behind as we tour the islands of Casco Bay and pass by 4 lighthouses, historic 19th century forts, and the scenic Maine Coast. Why board a larger, more crowded tour boat when you can enjoy our personalized service on a private tour? Charters depart from Portland's Old Port or from our dock, where free parking is available. Perfect for families and small groups, each charter is private for groups of up to 6. You've undoubtedly seen Maine's lighthouses in pictures and on TV, but now you can view them from the water on your own private boat! Commissioned by George Washington in 1791, Portland Head Light is Maine's oldest and arguably most iconic lighthouse. On our way, we will pass by Bug Light, Spring Point Ledge Light, Fort Gorges & Fort Scammel. Your guide will point out these and other interesting sights as well as any wildlife we encounter. 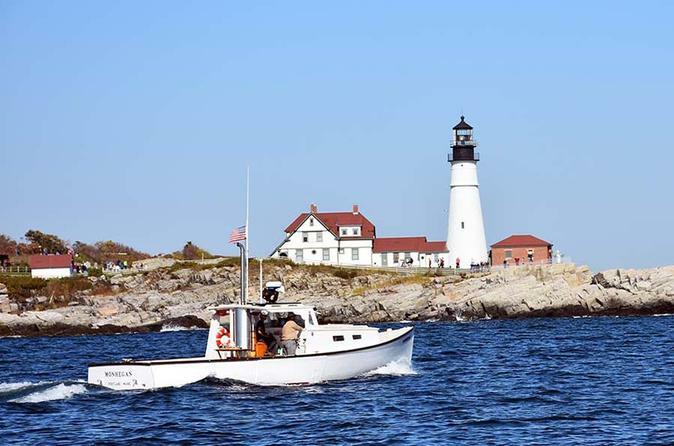 From Portland Head Light, your captain will navigate past Ram Island Light and then through some of Casco Bay's islands. You will watch Maine's rocky, tree-lined coast slip by as you relax on our deck chairs. MONHEGAN is a very stable vessel, and she is outfitted with a retractable weather cover so your comfort aboard is assured. If you wish, you can bring aboard food or beverages, and your guide will be happy to assist in serving. MONHEGAN is stocked with glassware, plates, and utensils. We provide a cooler with ice and bottled water on all charters. Alcohol may be responsibly consumed by our guests of legal age. Your guide is happy to assist in serving. Throughout the cruise, guests will find ample opportunities for photos. This is a fantastic way to see some of the best sights in the Portland area and will certainly be one of the highlights of your time in Maine.